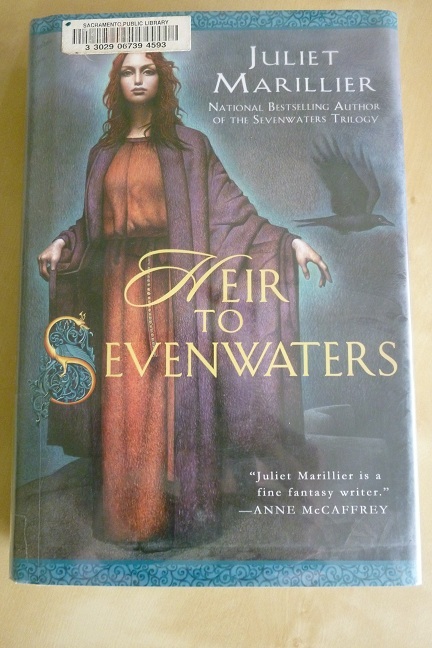 One of my goals for Once Upon a Time was to continue my way through the Sevenwaters series by Juliet Marillier. It’s a wonderful series that has been taking me far too long to read! I just finished Heir to Sevenwaters, and can happily report that it’s my favorite of the series so far. This could possibly be read independently of the first three, but there would be spoilers for the earlier books, and sorting out the family members and their various backgrounds and context could be confusing without knowing the first three books. The heroine of this story is Clodagh, one of the daughters of the Chieftain of Sevenwaters (and if you lose track of the family tree by this point in the series–I did–there are helpful guides at the beginning of the book). Clodagh considers herself a rather dull, domestic type, unlikely to do anything of any great excitement or depth. When her newborn baby brother is kidnapped, however, she must set off on a quest to rescue him from magical forces. And meanwhile there’s the question of Cathal, a young man who plainly has some connection to the recent turmoil, but whether for good or ill is much harder to say. This is Book Four, placing us beyond the original Sevenwaters Trilogy which all tied more closely together. It felt slightly removed from the first three, in tone and focus. Certainly it’s still part of the series, still in the same world, but it feels a little bit lighter and a little bit more focused. Of course, when I say “lighter,” that doesn’t mean there isn’t still dark magic and grim adventures! But it deals less with sweeping forces that will decide the fate of entire countries, and the magic has taken a less mysterious turn. The magic in the previous books was certainly present, but there was a strong Otherworldly mystique to it. We saw the magic folk mostly as very cerebral, very distant figures who drift on the edges of human affairs. This book had more of a straight fairy tale or folklore feel to it, with some elements reminscent of the ballad of Tam Lynn, and the magical creatures more resembling fairies or leprechauns of folklore. I love fairy tales, so I enjoyed this brand of magic. I liked Clodagh quite a bit, as I always have a soft spot for heroines who don’t realize their own strength. I really liked Cathal as the book developed and we learned more about him. Slight spoiler (though not much) to say that I inevitably loved him because I have an equally strong soft spot for grim, forbidding heroes who are hiding hearts of gold. The romance fell together a little easily, but for the most part it was an absolute delight. There are some clever plot twists in here that I don’t want to give away, and some very clever use of stories-within-a-story. I love books that feature the power of stories, and of folk lore as the key to a riddle or the answer to a quest. The novel is immensely engaging throughout, and I found it very difficult to put down during the last 150 pages or so (a common feature of Marillier’s writing, by the way). This is a new author for me, as is the fantasy genre. This Once Upon a Time event spurs me on to try some new titles … Marillier is added to my reading list … thanks! Wonderful! I hope you enjoy reading her! Or you could read Wildwood Dancing–it’s my favorite! Thanks for the link (though re-reading my post makes me smile, it was probably more of a spoiler-ific squee than anything else)!